NEW YORK - With its whitewashed bell tower, groomed lawns and Georgian-style buildings, Brooklyn College looks like a slice of Colonial Virginia dropped into modern-day New York City. But for years New York police have feared this bucolic setting might hide a sinister secret: the beginnings of a Muslim terrorist cell. 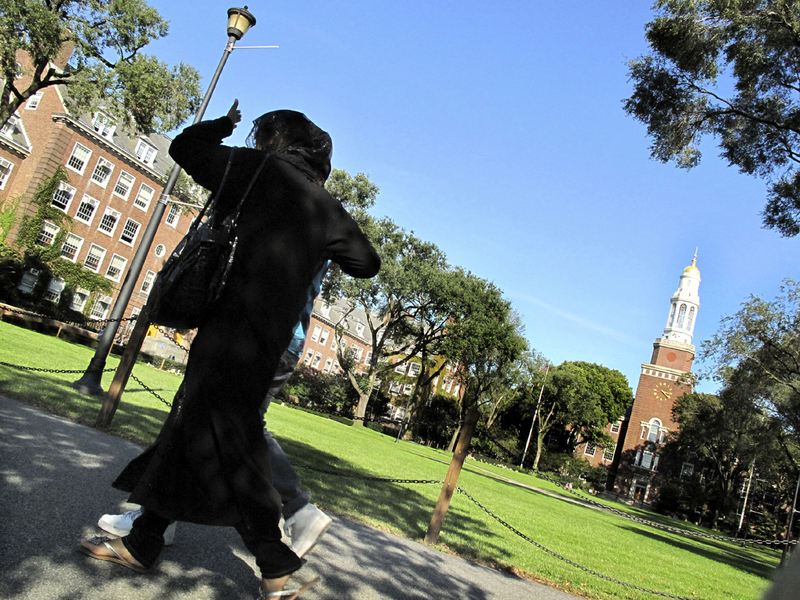 Investigators have been infiltrating Muslim student groups at Brooklyn College and other schools in the city, monitoring their Internet activity and placing undercover agents in their ranks, police documents obtained by The Associated Press show. Legal experts say the operation may have broken a 19-year-old pact with the colleges and violated U.S. privacy laws, jeopardizing millions of dollars in federal research money and student aid. The infiltration was part of a secret NYPD intelligence-gathering effort that put entire Muslim communities under scrutiny. Police photographed restaurants and grocery stores that cater to Muslims and built databases showing where people shopped, got their hair cut and prayed. The AP reported on the secret campaign in a series of stories beginning in August. The majority of Islamic terrorism cases involve young men, and infiltrating student groups gave police access to that demographic. Alarmed professors and students, however, say it smacks of the FBI spying conducted on college campuses in the 1960s. They are calling on college administrators to investigate. "It's really about personal freedom," said Moustafa Bayoumi, an English professor at Brooklyn College. "The government, through the police department, is working privately to destroy the private lives of Muslim citizens." Last week, professors at the City University of New York's Law School issued a statement warning that the spying at CUNY campuses may have violated civil rights laws. The Brooklyn College Faculty Council has passed a similar measure. Outside a prayer room used by their club on the edge of the Brooklyn College campus, members of the college's Islamic Society worried they might be marked for life  flagged on a terrorism watch list or blacklisted in a police dossier  because of the surveillance. "We come to the room, we talk, we chill," said Shirin Akter, 20, an elementary education major. "So if another sister comes into the room and she's a cop, that's not cool. I'm really scared about this." Following revelations about widespread spying, the New York City Council demanded answers Thursday from Police Commissioner Raymond Kelly, who defended the department he has transformed since the Sept. 11, 2001, terrorist attacks. He said police only follow leads and do not single out groups based on religion. "The value we place on privacy rights and other constitutional protections is part of what motivates the work of counterterrorism," he said. "It would be counterproductive in the extreme if we violated those freedoms in the course of our work to defend New York." The NYPD's intelligence division first turned its attention to colleges after receiving sketchy information that a student wanted to be a "martyr," according to a law enforcement official familiar with the program who spoke on condition of anonymity because he was not authorized to discuss the program. But police never found this person and did not bring cases charging Muslim student groups with training terrorists, the official said. In their surveillance, undercover officers from the department's Special Services Unit attended events organized by Muslim students, the official said, as did members of the NYPD's Demographics Unit, a secret squad that used plainclothes officers of Arab descent to monitor neighborhoods and events. The NYPD's Cyber Intelligence Unit used speakers of Arabic, Persian and other languages to monitor the websites of Muslim student organizations. They trolled chat rooms and talked to students online, the official said. By 2006, police had identified 31 Muslim student associations and labeled seven of them "MSAs of concern," the documents show. Six were at branches of the City University of New York: Brooklyn College, Baruch College, City College, Hunter College, La Guardia Community College and Queens College. The other was at St. John's University, a Catholic college in the borough of Queens. Members of the Brooklyn College Islamic Society said their association is typical of the groups. The club occupies two prayer rooms, one for men and one for women, off a student lounge on the western edge of campus. The American Medical Students Association is next door; the Veteran Students Organization is at the end of the lounge. On a recent afternoon, society members made their way past students playing board games in the lounge. Hip-hop music by Flo Rida and T-Pain blared from the office of another student club. The Muslim students entered the prayer room for men, knelt on a patch of carpet and recited quietly, occasionally touching their heads to the floor in unison. A bumper sticker on the door of the women's room read: "Discover Jesus in the Quran." A table held tracts with titles like "Women's Dress in Islam" and "Samples from the Illustrious Qur'an." A bulletin board offered free Arabic classes. Nazim Hussain, 21, a senior accounting major, said the club offers a quiet place to worship on the busy campus, as well as a social outlet. "It's just a brotherhood, nothing extreme, nothing like that," he said. "We just do football, basketball, stuff like that." The documents show police were interested in guest speakers and any signs of Salafism, a strain of fundamentalist Islam. The groups at Baruch and Brooklyn College's featured "regular Salafi speakers" and the one at City College had a "Salafi website," the documents said. "Students are politically active and are radicalizing," agents said of the Baruch Muslim Student Association. The group declined to make immediate comment. Mohammad Shamsi Ali, an associate cleric at the Islamic Center of New York, said some student groups have been known to invite speakers to campus without vetting them first. "Some MSA groups in some colleges are being influenced by Salafi tendencies because many of these students, they don't know who the speakers are," Shamsi Ali said. "They invite them to speak in the college, and they influence them. They influence the minds of the students." Police believed that the group at Queens College had a link to a member of Al-Muhajiroun, a Muslim organization that was banned in Saudi Arabia and Britain for condoning militant attacks. In a few instances, NYPD detectives approached campus police for help, saying they were working narcotics or gang cases to win their cooperation and sometimes even access to records, the official said. Police used the records to identify students they were observing and get contact information, the official said. The colleges may have broken the Family Educational Rights and Privacy Act, a federal statute, if they handed over student records without the students' consent, said Richard Rainsberger, a consultant on college privacy laws. The punishment for such disclosures is severe: a school can lose all of its federal funding. "That means every single federal dollar: the research funds, the federal loans, the Pell grants," said Meg Penrose, an expert on the privacy act at Texas Wesleyan University School of Law. U.S. Education Department spokesman David Thomas said the agency had not heard about the NYPD program. But he said colleges are generally barred from giving law enforcement agencies any student records without their consent unless police have a court order or subpoena. Sometimes, school police even let the NYPD use campus buildings as a quiet, out-of-the-way place to interview informants after hours, the law enforcement official said. By 2006 police had placed NYPD undercover agents at Brooklyn College and Baruch, according to the documents obtained by the AP. At Hunter, City College, Queens College, La Guardia and St. John's, documents said there were "secondary" undercover officers. It was not clear from the documents if that meant the NYPD was relying on another agency's undercover officers or if the NYPD was one of two agencies infiltrating the groups. The documents show police were worried about "militant paintball trips" organized by Muslim students at Brooklyn College. The Justice Department has in the past accused would-be terrorists of using paintball games as a sort of paramilitary training. But current and former officials said there was no standard for what kind of paintball trips the NYPD considered militant. An old website formerly used by the group shows photos from one of these trips to a paintball range in Jim Thorpe, Pa. An announcement for an upcoming trip gives strategy tips like separating players into offensive and defensive lines. It jokingly describes the "luxurious cheesebus" members will ride in and advises them to check "the back of your `Fruit of the Loom"' for equipment sizes. Islamic Society members said it has been years since members did any organized paintball trips. They scoffed at the NYPD report, noting that the club has also organized basketball, football and cricket games in the past. The City University of New York says it knew nothing about the infiltration at the time. Police have not acknowledged to administrators that such a program ever existed, CUNY spokesman Michael Arena said. But individual colleges said they were concerned. "It is our view that except in extraordinary circumstances where specific evidence links a member of a campus community to terrorist activities, the college community should not be involved with any such surveillance," said Maria Terrone, a spokeswoman for Queens College. "Had anyone on this campus been aware of this, we would have condemned it," said Jeremy Thompson, a spokesman for Brooklyn College. At Baruch, administrators do not believe they have a problem with student radicalization, said spokeswoman Christina Latouf. Professors have called the surveillance an attack on academic freedom. The Brooklyn College Faculty Council unanimously passed a resolution saying it would have a "chilling effect on the intellectual freedom necessary for a vibrant academic community." Forty-three law professors at the CUNY School of Law signed a statement last week warning that such surveillance may have violated students' civil rights. Undercover officers may also have violated a 1992 memorandum of understanding between CUNY and the NYPD, said Ramzi Kassem, one of the law professors. That agreement says that in non-emergency situations, police "shall enter upon CUNY campuses, buildings and other property only upon the request or approval of a CUNY official." Meanwhile, students said they worried the surveillance on campus could follow them after graduation or extend to their families and workplaces. "We have nothing to hide. But this is obviously baby steps: it could lead to something greater," said Sultan Alreyashi, 18, a freshman. "They could say, `Oh, now we need to investigate the mosques, now we need to investigate whatever.' So it becomes very disturbing to the whole community, not just to students in college. You give them a hand, they take a whole arm."